This was the perfect side dish for the sirloin I broiled for Grumpy, served with roasted asparagus and sauteed steak mushrooms with a couple shakes of mushroom soy sauce. Perfect comfort dinner for a nasty weather day. This dinner fits in with the “Meet MyPlate: A Guide for Healthy Eating” produced by the USDA and based ont he 2010 Dietary Guidelines for Americans. See more on this program at Allrecipes.com. Melt butter in heavy skillet. 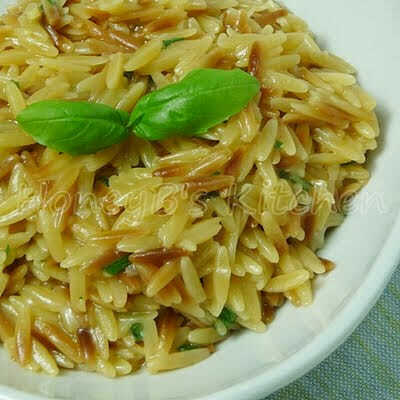 Once hot, add orzo and toast until pasta starts to brown. Add vegetable broth and bring to a boil. Turn down heat and simmer about 15 minutes, until liquid is absorbed and pasta is cooked. Stir in cheese and basil. Serve. OOh my does look wonderfu. I have to say SNAP too, as I too am submitting a Orzo dish to PPN. 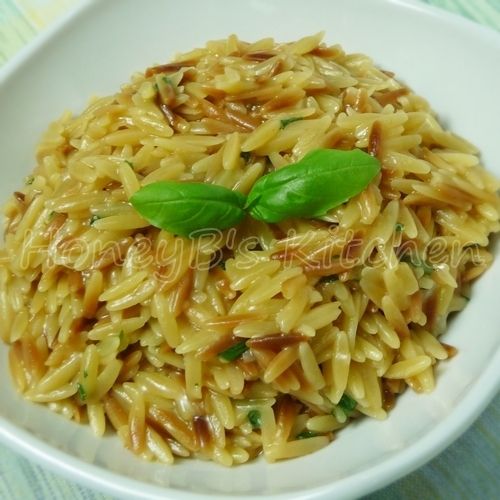 I am always looking for more orzo recipes we love it with cheese this looks great Shelby! Looks really delicious, Shelby! And easy too. I love orzo and I don't make it often enough either. This looks like a great, easy side dish. Looks great! I love orzo but have never had it this way. Thanks for posting! I am so in love with orzo and throw it in to soups, and salads on a whim. This cheesy version begs to be tried. This pasta looks amazing! I have tons of basil sitting in my kitchen…yum! I am SOOOOOO trying this next time I make steak. Sounds like the MOST perfect side dish!! Love this simple, but so delicious side dish! We just realized this summer how much we love asiago cheese (grated ourselves from a block) so I think I'll be buying another block of it soon to make this. Thank you for the recipe. Shelby love orzo pasta but I didn’t try often, good reminder about it. So simple, so droolingly delicious, I don't think I even need the steak! Those words from a serious carnivore. Thanks for sharing with Presto Pasta Night. 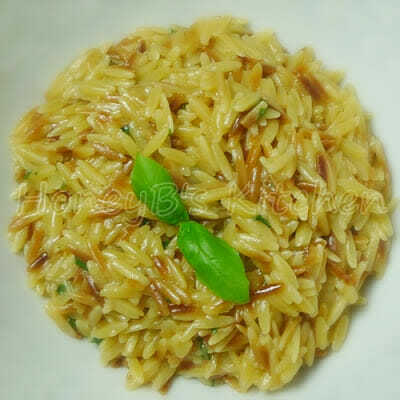 Looks yummy, and good enough to make me want to try cooking orzo. I haven't tried it before. YUM!!! I'm drooling over several recipes as I get caught upon your blog. This looks so easy. I love orzo pasta too! This looks delicious. I always forget about orzo. Don't know why because it is so easy to work with.